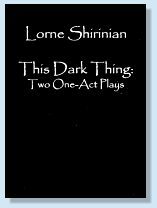 Blue Heron Press is pleased to announce the publication of an exciting new collection of plays, This Dark Thing: Two One-Act Plays, by Lorne Shirinian. The two plays, This Dark Thing and Red Threads on White Cloth are an exploration of the explosive forces that can lead to genocide and the need for survivors to tell of their experience. The first play, which gives the book its title, This Dark Thing, deals with intolerance to difference and the language of hate and aggression. The characters work in an ad agency where the constant rivalry among the staff boils over one night. The events that unfold are strangely parallel to those of the Armenian Genocide. The second play, Red Threads on White Cloth, is preceded by an introduction by the author, who explains the thematic and symbolic antecedents of his play. In the play, survivors of the Armenian Genocide talk about their fate, their survival and their unsuccessful attempt to have their voices and stories listened to and understood. The play dramatically highlights the necessity to listen to the voices of victims of crimes against humanity.